Tel Aviv University’s researchers discovered how to produce hydrogen from this kind of microscopic. The research was conducted by the School of Plant Sciences and Food Security at the TAU’s Faculty of Life Science and led by Dr. Iftach Yacoby. In the past, researchers were convinced that algae only produce hydrogen for just a few minutes at dawn. Such a short amount of time made it impossible to produce quantities of hydrogen. But using highly sensitive technology, the TAU researchers were able to discover that microalgae produce hydrogen all day long. 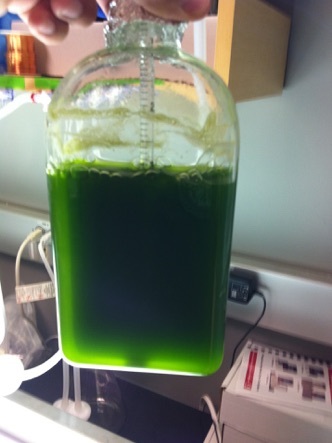 Laboratory tests revealed that algae produce hydrogen thanks to the enzyme hydrogenase, which breaks down when oxygen is present. However, if the oxygen is removed, hydrogenase doesn’t break down, and the algae keep on producing hydrogen. Once the researchers figured out how to eliminate the oxygen, they were able to achieve their goal. Based on this discovery, Yacoby and his team harnessed genetic engineering to increase the algae’s hydrogen production by 400 percent.